Board Defenders : Play this amazing logic puzzle game. Have lots of fun in the world of Playville! Board Defenders is super-structuring the rules of the world’s most popular game of all times. A modern vision thrilling and fun fast action game, combining the pace of an arcade with the challenge of a logic puzzle – brain game, based on chess rules. Taking place in the beautiful setting of “Playville” the game will make you live through an amazing and uncommon gaming experience. More than hundred of levels to progress through, each introducing new challenges to solve and presenting variety of difficulties to keep you on the edge. Four different unique action characters to play with, each having specific attitude on the board making the gameplay so exciting. Several enemies will step against you, separately or combined in different setups to create huge variety of unique challenges and puzzles to solve. Three beautiful relaxing locations to play in, each of them introducing a different game mode. Get prepared for lots of achievements. Challenge mode, to train your skills with specific characters and measure your score against the best around the globe. Compare your scores with other players in Google Play Services. Don’t forget to share the experience with your friends and family! 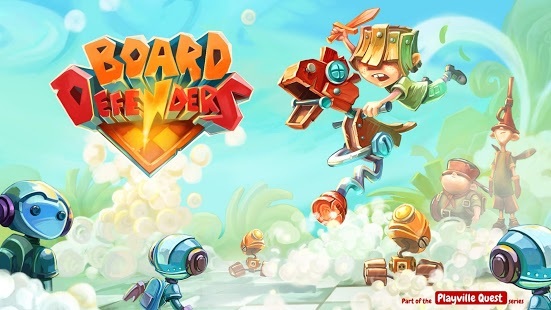 Board Defenders is part of the Playville Quest series. Lovely 🙂 I am still at level 9 but it seems to be a really great game!